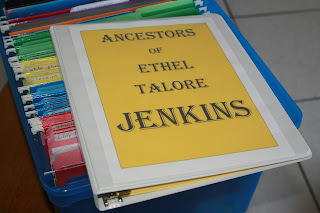 A collection of genealogical data and stories of who my ancestors were and where they came from. It is because of the decisions they made in their lives that brought me into this world. By Telling Their Tale I honor their lives. 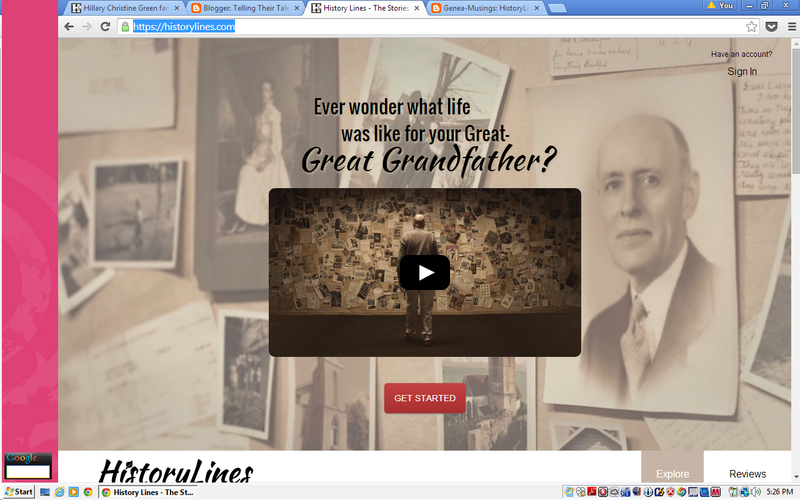 I recently learned about a new site that has launched called HistoryLines via Randy Seaver over at Geneamusings. 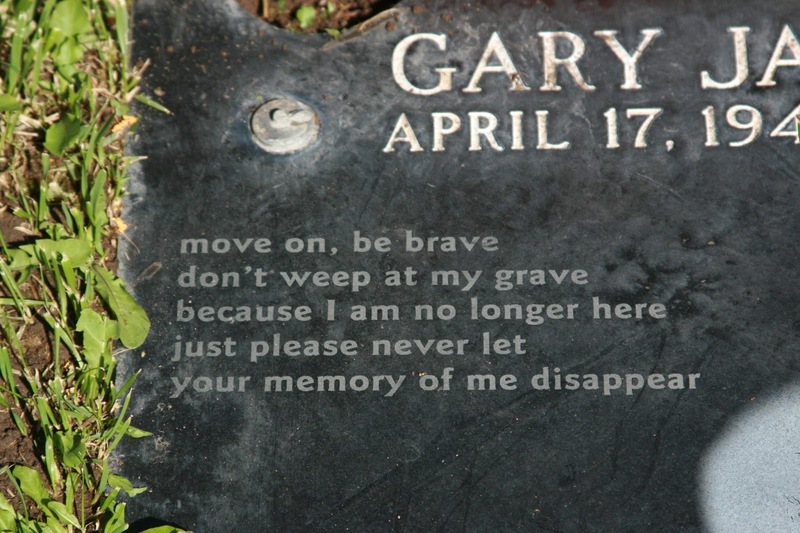 You can read Randy's post here. 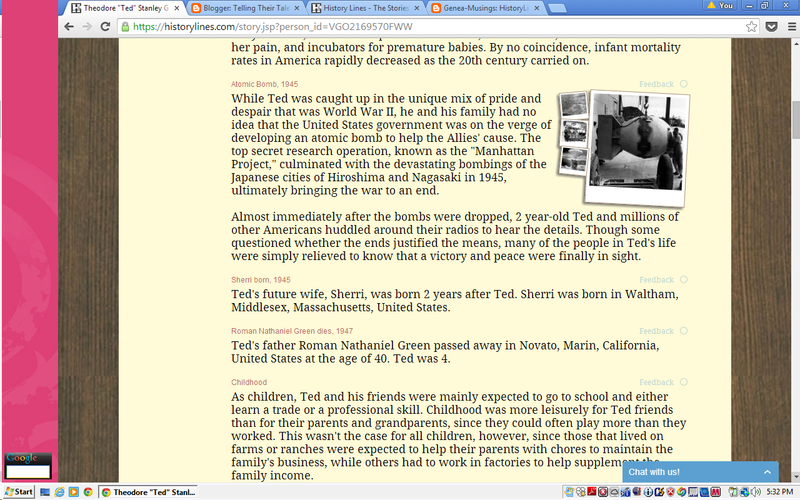 I decided after reading Randy's post, to jump on over to HistoryLines and play around myself. You can create a free account and create two stories for free. After creating a story for myself and for my father, and having great fun doing so, I decided to sign-up for the one year subscription with unlimited stories for $59.00. Here is my Dad's Story. As I scroll down the screen I see both world events, local events and personal events that took place during my Dad's life time. For me this is a very useful tool to have at my disposal! I have been working on writing my family history and this tool offers that added touch I've been wanting to implement in my book. I want not just names and dates in my family history, but also detailed mention of historical events that had an impact on each of my ancestors. While I will never know for certain the thoughts and feelings of my ancestors on such historical events, with HistoryLines I can get a pretty good idea of society in their time. 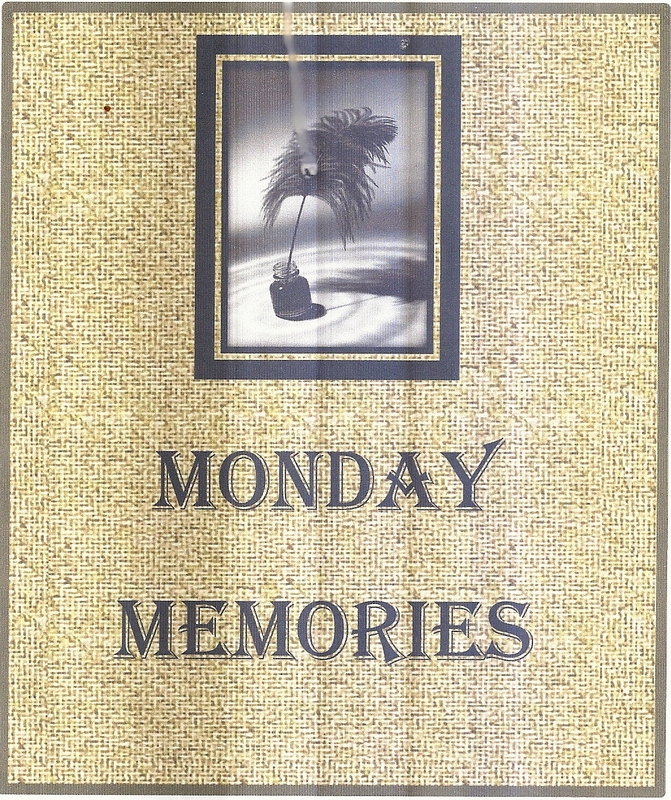 For my own personal story, I like that I can edit each historical event provided by HistoryLines and add my own thoughts, feelings and memories of each event and how it truly impacted my life at the time. 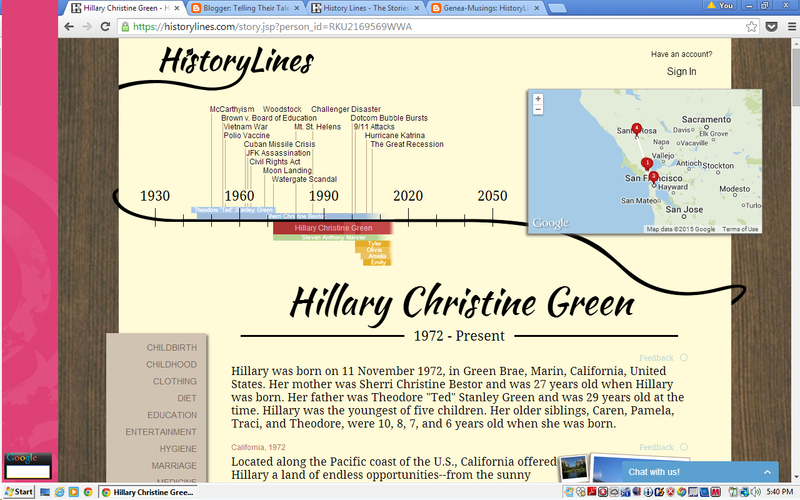 HistoryLines will certainly help me to create the family history book that I have longed to do with ease. 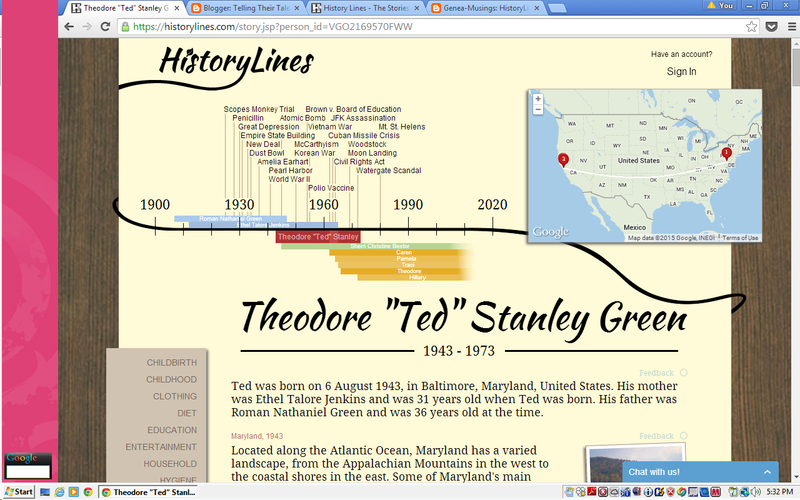 I highly recommend this tool to any genealogist interested in more than just names and dates! *I was not approached by HistoryLines for this review and was not provided any compensation by any parties mentioned. Last year I was gifted with a trunk which had belonged to my Grandmother Ethel Jenkins. The trunk had been in the possession of my Aunt Louise following the death of my Grandmother in 1964. When my Aunt passed away, the trunk remained in her husbands possession until his death last year. Upon his death my cousin gave the trunk to my Uncle Bill, the last of Ethel's living children. I received a call from my Uncle and his wife asking if I would like to join them for lunch. I did, and it was during this lunch that my Uncle told me the trunk, and all it's contents, were mine if I wanted it. I couldn't believe my ears and immediately said YES!! We made arrangements to meet in a few weeks time at his home for me to look through the trunk and take whatever I wished. The morning of the day I was to see the trunk for the first time, I couldn't contain my excitement! I had shared with my Mom and my siblings that I would be receiving the trunk and they too were eager to find out what it contained! My oldest sister Caren, who had learned from our cousin that the trunk contained fabric, asked if she could have the fabric. She is a wiz with needle and thread and an avid quilter, so I of course said yes! When I arrived at Bill's home he took me out to his back patio where the trunk was being stored as there was no room in his small condo. The trunk is a steamer style trunk measuring 33"x18.5"x23". Inside it has a shallow lift out "drawer" with a deeper compartment below. On the top of the trunk written in white paint is the name of my Great-Uncle, and older brother of my Grandmother. He was Rolla David Jenkins and he moved to Novato, California from Pennsylvania between 1942-1945 with his wife Annie. My Grandmother inherited the trunk upon the death of her brother, Rolla, in 1956. Rolla had inherited the trunk upon the death of his mother, and my great-grandmother, Verlinda Ellen Hardman in 1941. Inside this trunk was a plethora of family treasures! I am so blessed that my uncle choose to pass tis trunk on to me!! I will be photographing and documenting all of the trunks contents over the next several weeks. Join me each Thursday as I share these treasures! 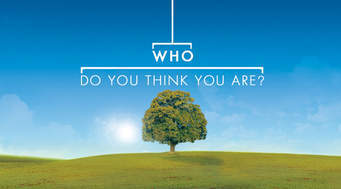 Sunday brought with it the season premier of Who Do You Think You Are. This weeks episode we followed Julie Chen as she traced the ancestry of her mother. I am a fan of Julie Chen and was very eager to watch this episode and to see her personal journey into her families historical past. Julie began her search by looking into the past of her maternal grandfather who died before she was born and who she new very little about. The first stop on her journey was to Singapore where she new her grandfather had died. From there she was able to learn the name of the village in China where her grandfather had been born. What intrigued her most was learning from her grandfathers obituary that he had had an "improper childhood." She wanted to find out more to explain this statement. She traveled to his hometown village in China where she not only discovered the meaning behind him having an "improper childhood" but also learned that her great grandfather had been appointed as director of education by the Emperor in the Qing Dynasty! She was able to visit a school her grandfather had founded and was able to meet a distant cousin who took her to visit the sacred burial sight of her great grandfather. Overall I found this episode very enjoyable! Julie's display of genuine emotion was refreshing. My only disappointment was she didn't learn more about other generations of this family line. Halloween has always been one of those fun filled holidays for me. I have always loved all aspects of this pagan holiday; the costumes, the makeup, the chance to be someone or something else for a day, and of course THE CANDY!! 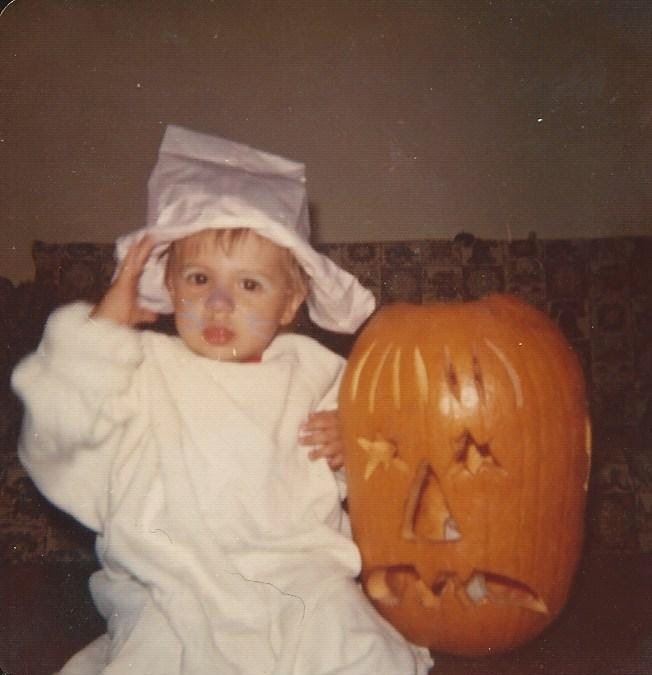 I do not have any memories of my first few Halloweens, but family photos show I was dressed as some sort of strange baby in an oversize shirt and a paper hat at the age of one and as what appears to be a pregnant child at the age of two….not sure what that was all about. At this stage of my life I lived in a very full house with 4 siblings, my mother, my aunt and boyfriend and a family friend. By all accounts it was a crazy environment! My own memories of Halloween begin when I was four years old. This was the year that Star Wars premiered and of course my costume of choice that year was Princess Leia. 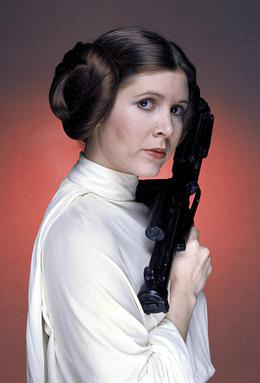 I recall sitting patiently in a green chair in our living room of our Center Road house as my Mom braided my hair and pinned the braids to my head as Princess Leia had worn hers. I was so excited I could hardly sit still! 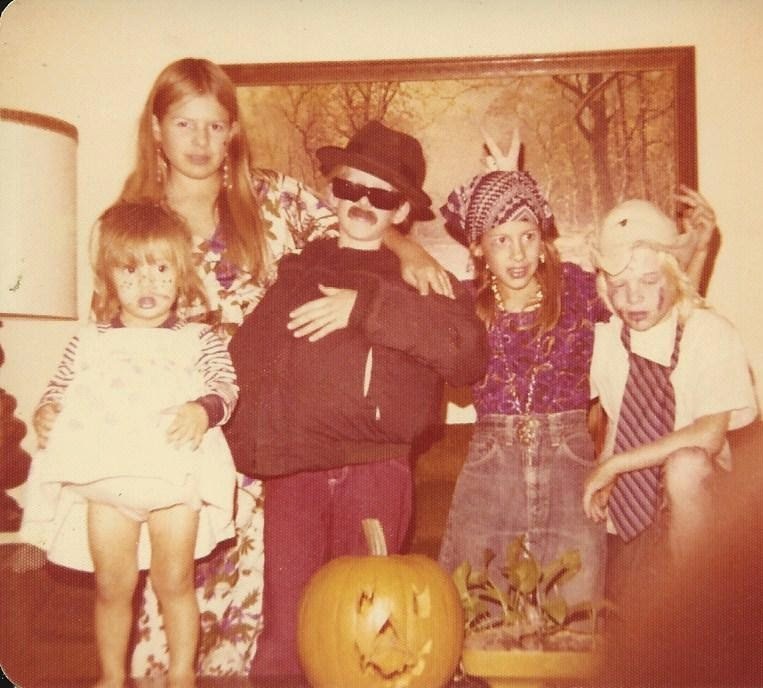 When I was officially transformed into Princess Leia, I was sent out the door with my four older siblings, who had all choose to dress up as the rock band Kiss! What I sight we must have been walking down the street and going door to door……….a mini Princess Leah and Kiss!! When I was seven I was a 1920’s flapper girl. I borrowed a blue sparkly dress from my teenage neighbor. I believe it had been a costume she had worn in a school play. This was also the first year I participated in an annual parade in my neighborhood. San Andreas Dr. was the starting point of the parade route and the parade marchers would turn on San Carlos Dr and head to San Ramon Way. Our final destination was San Ramon Elementary school where the parade participants would take part in a costume contest. Prize ribbons would be awarded to the 3rd, 2nd, 1st place winners along with one over-all 1st place winner. The participants who did not place received a participation ribbon. I got my white participation ribbon and was as happy as could be. The next costume I recall was my Moms creation, or idea I should say. I was in the 4th Grade and my mom thought it would be a great idea for me to dress up as Gandalf from “The Hobbit” and for my 2 year old nephew to dress up as Bilbo Baggins. Oh My! I don’t know if I can quit put it into words to describe this costume or the ordeal of actually having to wear it, but I’ll give it a solid try! The costume itself was hand made by my older sister, who was, and still is, a true talent with needle and thread! It was made entirely of heavy blue felt. I had a large blue dress, or gown, that hung down to the ground hiding my feet. I had a rope tied around my waste, and a long blue felt cape tied around my neck. Atop my head I wore a tall black hat, and attached to the hat was a long grey beard. A very long grey beard! On my nose I wore an artificial nose made of putty. A very long nose! The piece de’resistance was a long wooden staff I carried. My nephew, as Bilbo Baggins, had a similar outfit made from brown, grey and green felt. He was to wear shoes outfitted with large furry feet, which I’m sad to report he was terrified to wear!!! Although, a more accurate description would be he was terrified to be in the vicinity of said furry feet!! So, come parade day, I walked in the parade alone and in absolute misery! Why misery you ask…..let me explain this horrible experience as best I can. I must start by stating in the state of California we frequently have what some term “An Indian Summer”, meaning our autumns can sometimes be much warmer than our summers! This particular October was one of those Indian Summer Autumns! I was dressed from head to toe in a fabric not meant for warm weather, especially not in layers! In addition to my smeltering outfit, I was forced to wear that horrible putty nose, which smelled so horrendously bad I cannot truly describe the sent! At this point I must inform my readers that I was a child who needed to wear glasses simply to see my own hand in front of my face clearly. 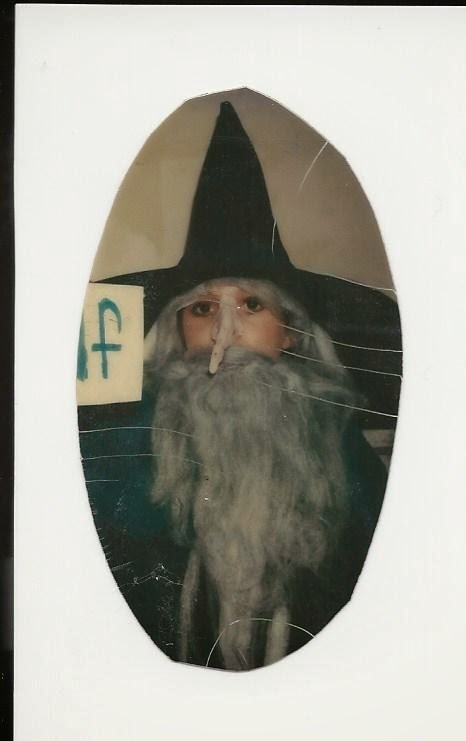 However, my mother insisted I could NOT wear my glasses while in costume because Gandalf did not wear glasses! So, I was sent off in the annual Halloween parade dressed in an outfit not fit for 80 degree heat, with a putty nose upon my face which made me want to gage, all the while not being able to see clearly two feet in front of myself! By the time I reached my final destination I had a headache so bad I felt as if I were going to vomit! I don’t truly recall the judging ceremony, other than clearly wishing to be anywhere but where I was at that moment. By the time the judging was over, I did not even want to wait to receive my white participation ribbon. I just wanted to go home and rip my costume off! My mom insisted we stay for the announcement of the winners, but agreed to allow me to remove the offensive nose, hat, beard, and cape and to finally put on my glasses. And so it was in this condition that I was called to the podium to receive my blue First Place Ribbon! I can still hear the announcer saying, in a somewhat bewildered tone as I walked to the podium, what a wonderful “witch” costume I had on. I’m sure the announcer was questioning the judges’ decision at that point! I ended up being Gandalf two years in a row and won first place both years. 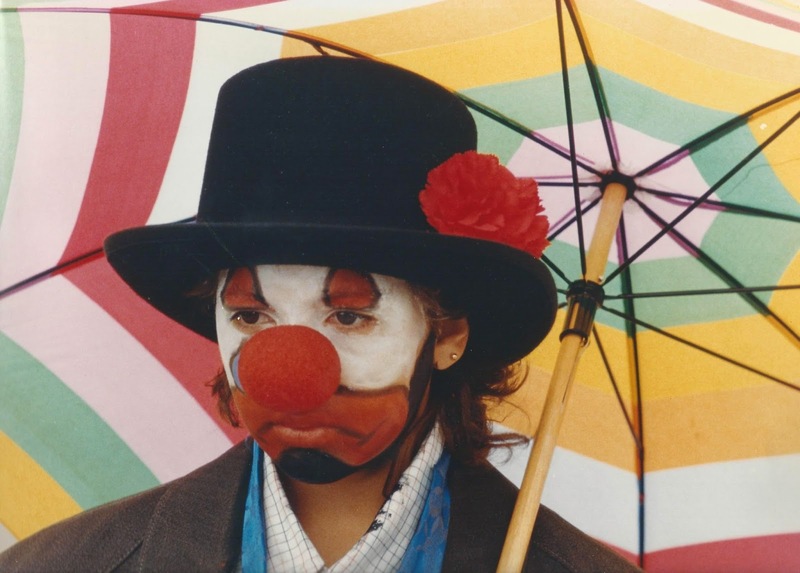 The next costume I recall was a Hobo Clown when I was in the sixth grade. This too was my mother’s creation. I wore baggy overall, a large black coat with a flower in the laple and carried a large rainbow umbrella. My face was painted with face paint with a frowning mouth. The face paint meant I was not allowed to wear my glasses. However, this time I did not have the added stench of a horrible putty nose, and this October was much cooler, so my walk in that year’s annual Halloween Parade was much more tolerable. 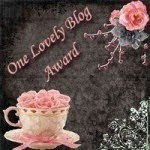 And when I was again called to the podium to receive my First Place Ribbon I was truly excited! As an added bonus, my stepfather, who had taken a photo of me, won first place in a Kodak photo contest he had entered the picture into! The photo appeared in our local papers and the photo was shown around the world. Well, I don’t really know that part for sure, but one never really knows! 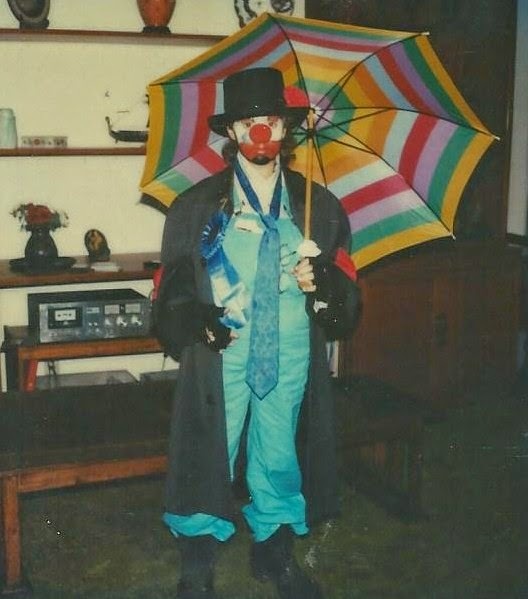 The Hobo Clown was my last time participating in the annual Halloween Parade, but it was not my last time dressing up for Halloween! In the years that followed the Hobo, I was a baby, a 50’s Sock-Hop girl with a pink poodle skirt, and finally Dorothy from the Wizard of Oz. I am always looking to expand my knowledge while at the same time work towards a rewarding end. To keep with this theme I have enrolled in the Genealogy Essentials Program through Boston University. I am using this course as both a time to build on the knowledge I already have of genealogical research and to also use it as a stepping stone in my ultimate goal of becoming a certified genealogist. The course began on Tuesday and has four modules. Each week a new module opens up. This is a relatively self paced coursed in the sense that I can work on the assignments when it is convenient for me, with the clear that each week the assignments have a set due date at the end of each week. I'm loving it so far and while I didn't think I'd learn to much I didn't already know, I have learned a few things that will aid me as I continue to uncover the lives of those who walked before me! Sorting Saturday -- Getting Genealogy papers organized! I have been researching my family genealogy since the early 1990’s. As you can imagine I have gathered a mountain of documents, photographs and other family memorabilia. All of which requires organization of some kind. Over the years I have had many, many filing systems, but none was ever quite sufficient for my needs and data retrieval. 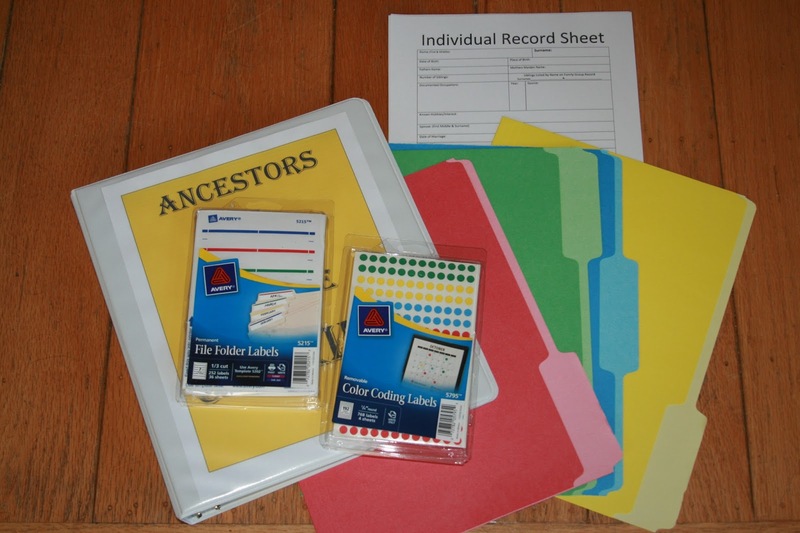 Last year I converted to a color coded system for all my paper hard copy records and let me tell you………….what a HUGE difference it has made in my genealogical research!! I can now easily find data I need when I need it and I can easily and quickly file any new data and documents I discover. I also have a computer filing system which I will discuss in a later post. 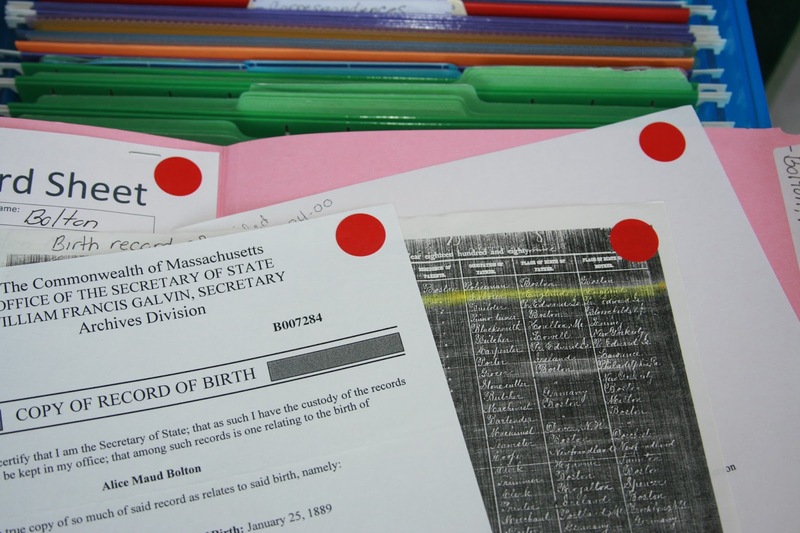 The purpose of this step by step post is to explain how my paper system works in hopes that it could help other genealogy hobbyist to get their paper documents and data into a streamlined organization system. I assigned a color to each of my four grandparents, my step-father’s family, and each of my husband’s four grandparents. v You will need colored file folders and colored hanging file folders in each of the colors you have chosen to represent your ancestors. v File Folder Labels. You can purchase labels with a colored line across the top in Red, Yellow, Blue & Green. Or simply use plain white labels. v One binder for each of your color coded ancestors. I prefer the binders where you can slip a paper in the cover and spine. If you are color coding just your four grandparents, then you will only need four binders. Because I have color coded my step-family and my In-Laws I have a total of nine binders. v Binder dividers with clear non-colored tabs. One 8-10 sheet set for each of your binders. v Colored circle labels. Both large and small. You can purchase packages of primary colors (Red, Blue, Yellow & Green), our purchase just plain white circle labels and color in yourself. I did this with the other colors I chose to represent my step-family and in-laws. v Sharpie pens in all the colors you have chosen to represent your ancestors. 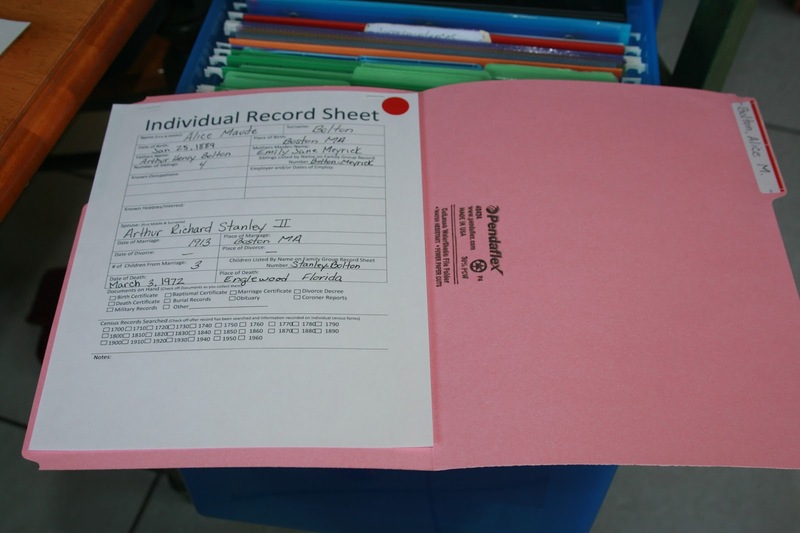 v Starting with the colored file folders you have chosen to represent your Maternal Grandfather; place a label onto each file folder. v Write the name of your Maternal Grandfather on one folder and place into your box. Write the name in a Last, First Middle format. 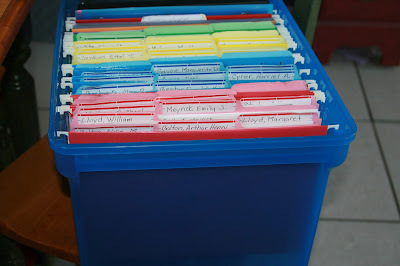 v Continue writing the names of each ancestor connected to you through your Maternal Grandfather on each of the folders in the color representing you Maternal Grandfather. 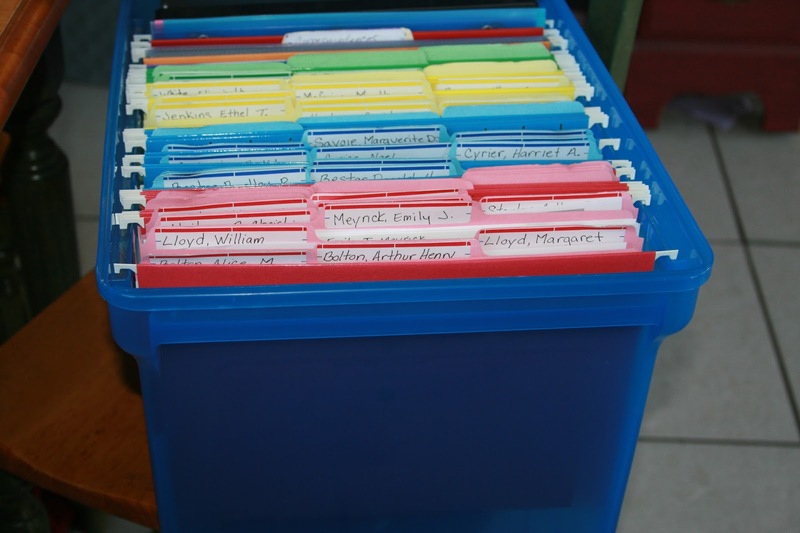 v Continue the above steps for each of your other three grandparents until you have a folder for each known ancestor. v Fill out the Individual Record Sheet with detailed information about your Maternal Grandfather. 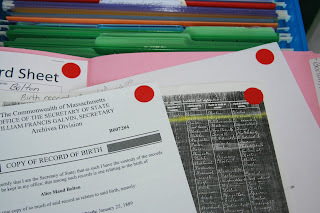 v Using your colored circle labels; place a colored sticker on ALL documents you have pertaining to your Maternal Grandfather (birth record, census records, marriage records ect). I place the sticker in the lower right corner of all documents. If you don’t want the sticker on the front of the document, place it on the back. v You will continue this process for each ancestor who you have created a file folder for being sure to place an appropriate colored circle on each document before placing it into a file folder. v Using your colored card Stock/construction paper, make a cover and spin label for each of your four binders using the colors you have chosen for each of your four grandparents. 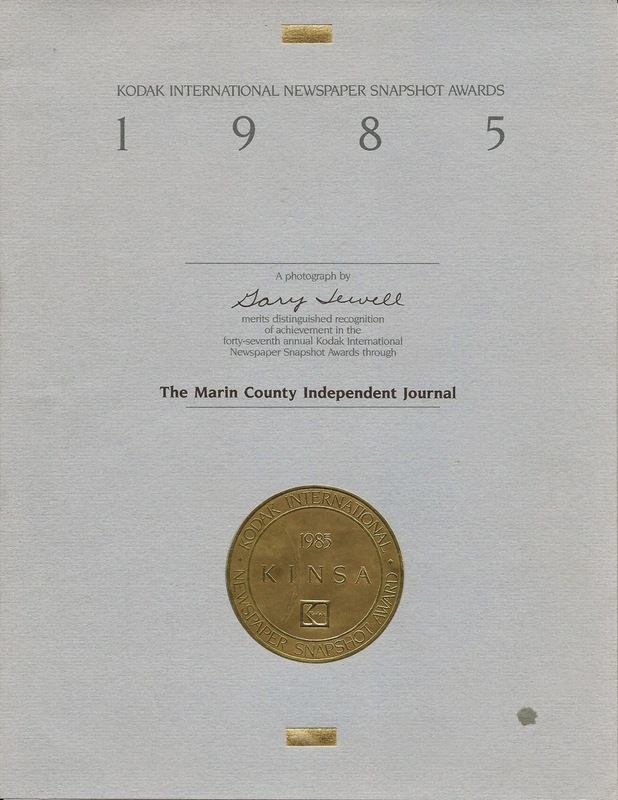 You can also create a cover using a word processing program on your computer. v Label each divider with a surname connected to you through your Primary Ancestor. For example the surnames connected to me through my Maternal Grandfather are Bestor, Cyrier, Savoie, Hubbard, Chartier, and Force. I place the labels in my binder in order by generation. Therefore the Surname at the beginning is my Grandfather’s, then his parents, then their parents and so on. v In each Surname labeled section place your Family Group Record sheets. I make two copies of each family record so I have one filed under the husbands Surname and one filed under the wife’s surname. I highlight with a yellow highlighter which person it is filed under (Husband or Wife). Within each section I file alphabetically by first name, then middle. v In each Surname section I have a running Document Log for each ancestor in that surname. This allows me to quickly see what documents I have for an individual and what ones I still need to do research on. v Within each Surname section I have a subsection labeled “Maps” This is where I place all maps pertaining to the locations of residence for that surname. Note: I keep my index card file box next to my computer for easy access when I’m researching online. v On the index card, write that ancestors’ vital information: Birth date and Location; Death Date and Location; Marriage date and Location. 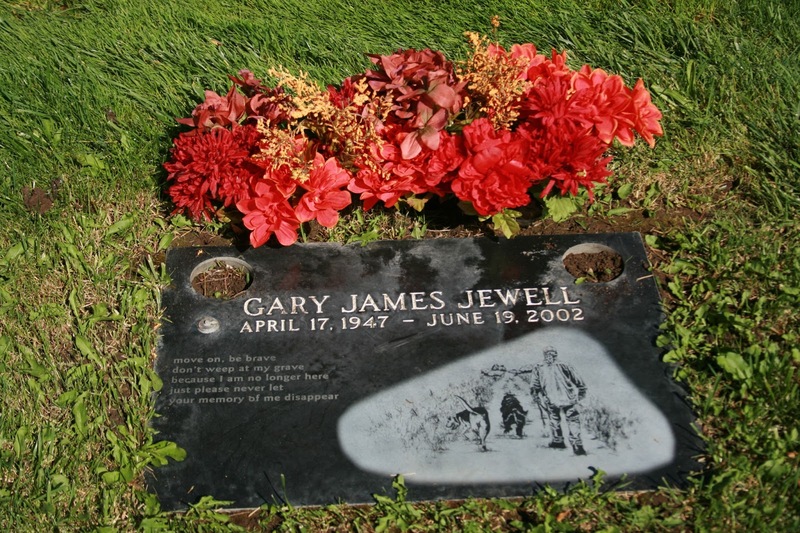 Parents names, Spouses name, children’s names, siblings names; Burial information; Occupation ect. Use both sides of the index card. v In the upper right corner of each card place a color coded sticker indicating which Primary Ancestor connects you to the ancestor named on the card. 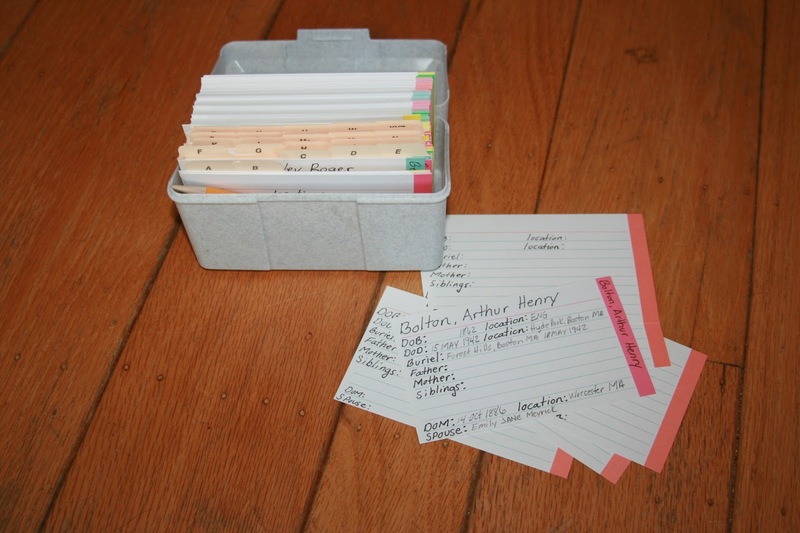 For my four grandparents I was lucky enough to find index cards with a colored strip on the top that matched the colors I had chosen for each of them. As I stated above, I started using this system about a year ago after years of using various other filing systems…..by document type, by surname ect, and truly LOVE my color code system. I am able to quickly find information and I know immediately how each ancestor is connected to me with a simple glance. I will never file my paper genealogy documents any other way!! 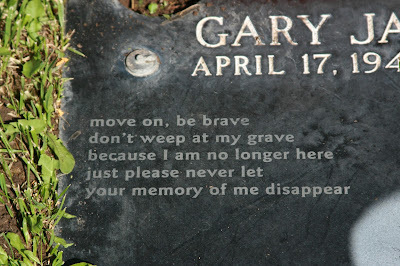 Etched onto the stone is a quote from a Dream Theater song; "The Spirit Carries On" which we heard in his truck just days after he passed away. 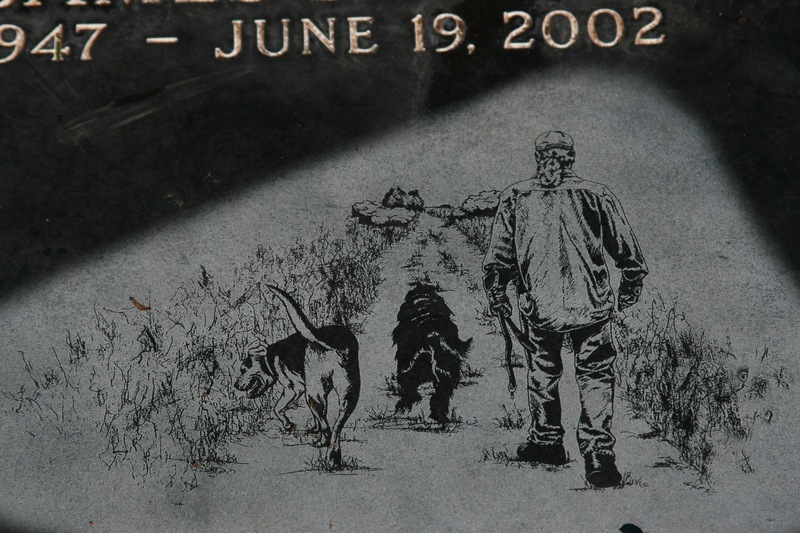 This picture was drawn by my sister and etched onto the stone. It shows our stepdad doing his favorite activity....walking his beloved dogs Emma and Marley who have since joined him in heaven. HAS IT BEEN 30 YEARS?